Common Good wishes all of our readers a holiday season filled with abundant joy and reverence. You will hear from us again in early January! Applications due March 1, 2013. For the past seven years, the law firm Goodwin Proctor has invested in a diverse legal community by offering offered fellowships to high-achieving law students of color. Our fellowship program offers awards of $7,500 to students of color who work in public interest positions the summer after their first year of law school. This program allows us to connect with a wide array of talented students early in their legal careers who are committed to giving back to their communities. In addition to the monetary fellowship award, selected fellows are guaranteed a “straight-to-callback” interview with the Goodwin Procter office of their choice in the fall interviewing season during their second year of law school. Fellows will also be invited to participate in some of our summer associate program events during their summer at the public interest organization. Additional information on the Fellowships (including how to apply) can be found here. Application deadline is January 11, 2013. The Northwest Justice Project (NJP), Washington’s publicly funded legal aid program, is currently seeking to fill positions in its Yakima, Seattle, and/or Tacoma offices to assist with the new Home Justice Project. Home Justice Project attorneys will undertake mission directed work statewide to mitigate the long-term effects of the foreclosure crisis. Application details are available online. Internship opportunities are available for law students at Business and Professional People for the Public Interest (BPI) in Chicago. These internships offer interns broader exposure to policy research, lobbying, and coalition building. BPI is a public interest law and policy center that addresses compelling issues of social justice and quality of life in the Chicago region. BPI’s staff of lawyers and policy specialists uses legal and policy research, advocacy, organizing, litigation, and cross-sector collaboration to affect change in the areas of affordable housing, public housing, public education, and political reform. Each summer, BPI hires 6–8 interns from law and graduate policy programs across the country to perform mission-critical work across several project areas. In addition to providing interns with challenging work and meaningful feedback, BPI hosts weekly brownbag lunches to educate interns on different areas of our work and organizes social outings to foster a collegial working environment. 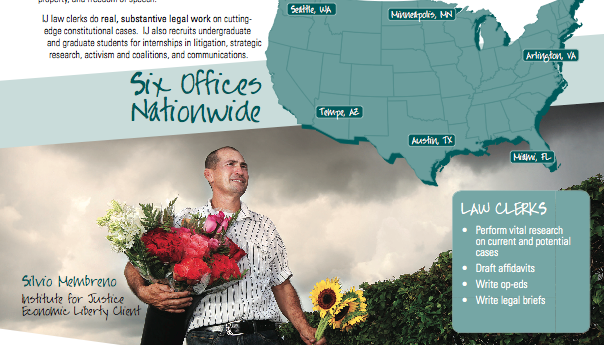 BPI summer interns have gone on to work at legal aid organizations, policy centers, and law firms across the country. Additionally, several members of our staff started as BPI summer interns. Through Chicago’s Public Interest Law Initiative (PILI), we offer paid internships to law students unable to secure funding through other sources. Internship offers are made on a rolling basis until the class fills, so students are encouraged to apply early to remain competitive. For more information, see the online flyer 2012-2013 Intern BPI Flyer. The Legal Aid Justice Center seeks a bilingual attorney to join its office in Falls Church, Virginia. The work includes the provision of general civil legal assistance in the areas of housing, consumer, and employment law for Northern Virginia’s diverse low-income immigrant communities. The Legal Aid Justice Center also provides extensive representation to, and work closely with, the region’s predominantly Latino day laborers. The Legal Aid Justice Center is a nationally recognized, non-profit program providing free civil legal assistance from four offices throughout the state of Virginia. Our dynamic staff of more than thirty advocates pursue systemic legal advocacy for all low-income Virginians using a wide array of strategies. Through legal representation, community organization, and statewide advocacy, the Legal Aid Justice Center works both to eliminate the immediate symptoms and to address the underlying causes of poverty in Virginia. The Center encourages diversity, value unique voices, pursue our goals with passion, and have fun while working for the public interest. Qualifications include membership in the Virginia bar or eligibility to waive in immediately and Spanish language proficiency. Competitive public interest salary DOE. Exceptional fringe benefits include generous leave, fully paid health insurance, retirement plan, student loan repayment assistance, and a great work environment. E-mailed applications will only be considered if followed by a hard copy. Last month we notified you of the Center for Public Service Law second annual San Francisco Public Interest Law City Visit for Friday January 18, 2013. WE MUST NOW CONFIRM ATTENDEES IN ORDER TO GO FORWARD WITH THE EVENT. If you wish to attend, contact Dean Storms at mestorms@uw.edu no later than December 20, 2012 at 5:00 p.m.. If we do not have the minimum number of attendees by this time the event will be cancelled. 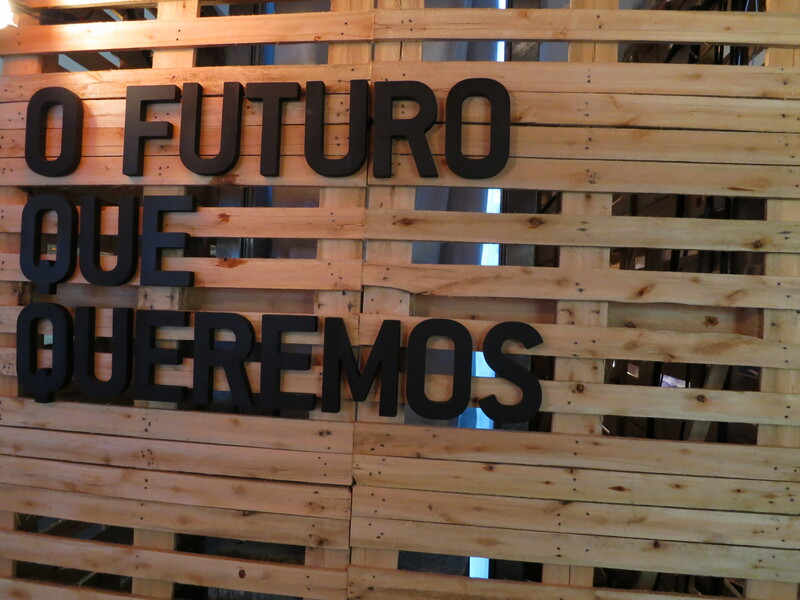 DETAILS: On January 18 we will visit 4 public interest/public service agencies in the city of San Francisco. This year we will visit the Equal Employment Opportunity Commission (EEOC), Equal Rights Advocates, the International Justice Resource Center and the National Housing Law Project. Last January 2012 we visited 4 different locations; 9 UW Law students went on the trip and received excellent exposure to public interest law in San Francisco. WHY ATTEND? If you are interested in seeking summer positions in San Francisco or if you think you might practice public interest law in San Francisco after graduating then this is a great opportunity to get a sense of the lay of the land in SF. At each place we visit, the organization will give us a brief presentation and then lawyers on staff will answer our questions. Meeting the public interest lawyers in these offices will help you to begin building relationships — which is vital to “breaking in” to a new community. None of the employers we visit can guarantee our students jobs, but at least one attendee from last year secured a summer position after visiting one of the sites. WHAT ARE THE EXPENSES? 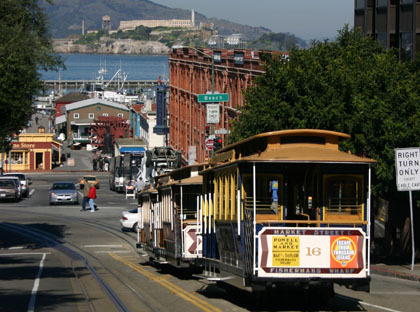 You must provide your own transportation and lodging to and from San Francisco. On Friday we will provide lunch and although most of these organization are within walking distance of each other if a bus or cab is necessary we will cover that as well. HOW TO RSVP: Contact Dean Storms at mestorms@uw.edu if you are interested in attending or if you have additional questions. 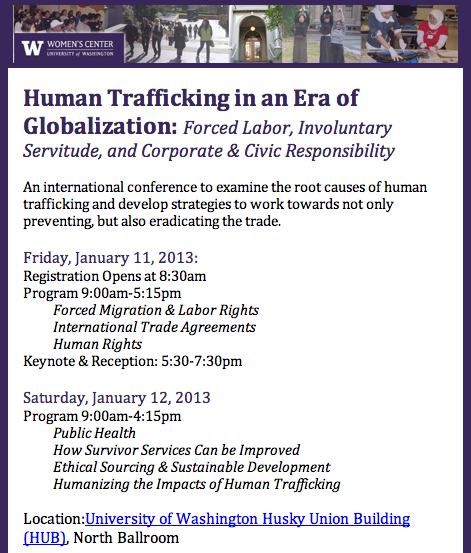 Deadline to confirm attendance is December 20 at 5:00 p.m.
Law Students, attend the upcoming Human Trafficking Conference, January 11–12, 2013, at a special rate of $50 early registration/$75 after December 28th. A separate link to student registration can be found online here. Please contact Ashley Velarde (avelarde@uw.edu) to pay by cash or check. A valid student ID is required. The Conference, Human Trafficking in an Era of Globalization: Forced Labor, Involuntary Servitude, and Corporate & Civic Responsibility, is an international conference to examine the root causes of human trafficking and develop strategies to work towards not only preventing, but also eradicating the trade. The application for the 2013 Summer Corps program opens Tuesday, December 18, 2012, and we will be accepting students into the program on a rolling basis until the application closes on Monday, March 18, 2013. 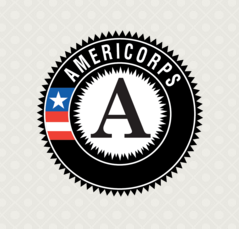 Summer Corps is an AmeriCorps-funded program that will provide 1L and 2L students with the opportunity to earn a Segal AmeriCorps Education Award for dedicating their summer to a qualifying legal project at a nonprofit public interest organization. For more information on the Summer Corps program and application process, review our FAQs for applicants. Interested in learning more? Equal Justice Works is hosting upcoming informational webinars. Members of its Federal Programs team will discuss in detail the Summer Corps program and how to create a successful application. Viewers will be able to ask questions during the webinar. In the meantime, please direct questions to summercorps@equaljusticeworks.org. The University of Montana School of Law’s Public Land & Resources Law Review and the Section are pleased to announce the 2013 Student Writing Competition, in conjunction with the ABA Public Lands and Resources Law Symposium. Entries should demonstrate original thought on a question of legal and/or policy significance relating to the symposium topic of the role of public lands and oceans in America’s energy future. The Peggy Browning Fund Fellowship Program is offering 2013 Summer and School-Year Fellowships. These Fellowships are funded positions in labor-related organizations throughout the United States. The School-Year Fellowship funds one part-time position in Chicago in 2013–2014. More information is available at www.peggybrowningfund.org. Application deadline: January 18, 2013. Apply online. Application deadline is January 4, 2013. Founded in 1991, the Institute for Justice engages in cutting-edge litigation and advocacy both in the court of law and in the court of public opinion on behalf of individuals whose most basic rights are denied by the government-like the right to earn and honest living, private property rights, the right to free speech, and educational choice. The Institute for Justice is now accepting applications for 2013 Summer Clerkships. Summer clerkships are open to first and second year law students and are available at the Institute for Justice’s headquarters in the DC metro area and at our chapter offices in Austin, TX; Miami, FL; Minneapolis, MN; Seattle, WA; and Tempe, AZ. Students interested in applying for summer clerkships should apply at www.ij.org/internships. Summer clerkships are offered on a rolling basis and students are strongly advised apply by January 4, 2013. Applications are only accepted through the IJ website. For more information on the Institute for Justice, our cases or our student programs visit www.ij.org/students or contact Krissy E. Keys, Special Projects Manager, at kkeys@ij.org. The Northwest Justice Project, Washington’s largest statewide publicly funded civil legal aid program, is hiring for two positions. 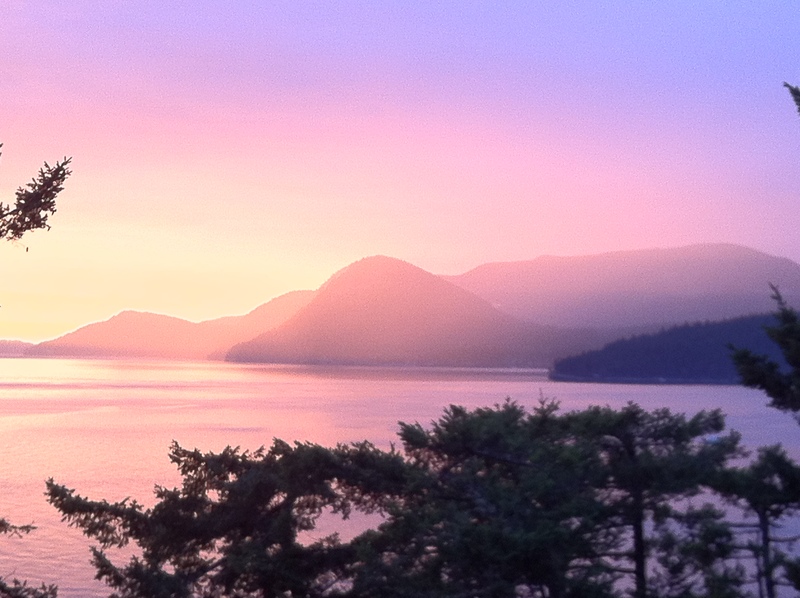 1) Foreclosure Prevention Staff Attorney in Bellingham, Washington (application deadline January 11, 2013). 2) Senior Attorney in Pasco/Walla Walla, Washington. Application deadline is February 11, 2013. The Bergstrom Child Welfare Law Summer Fellowship is committed to inspiring the best and brightest law students to pursue careers in child welfare law. Through the fellowship, students gain experience and insight into the field and provide much needed services to various child welfare offices specializing in representing children, parents, and social service agencies. 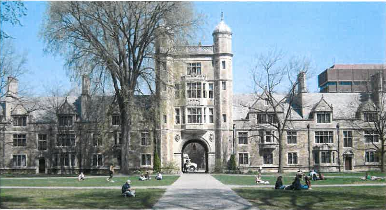 After attending a three-day training session May 20, 21 and 22, 2013,at the University of Michigan Law School, Fellows spend at least 10 weeks at their placements. Our selection criteria include evidence of commitment to the field of children’s law, past experiences related to children and family, and performance indicative of likely future success in the field. We will give some advantage to students who have arranged their own summer placements and all or part of their summer living stipend. Interested applicants should not be deterred if they have not identified their summer placement or source of summer money, however. Once accepted into the fellowship program, we will assist in placement and the search for funds. View the application to apply. Please contact Alicia Lixey, Training Coordinator, with questions at 734-763-6750 or by e-mail at lixey@umich.edu. Applications received by December 31, 2012 will receive full consideration. Applications will be accepted on a rolling basis until position is filled, however. The Northwest Immigrant Rights Project is hiring for two attorney positions in our Seattle office. The first position seeks an attorney to work under a new grant providing immigration legal assistance to survivors of torture. The second position seeks a bilingual Spanish-speaking attorney to help us continue our work on behalf of immigrant youth seeking assistance with the Deferred Action for Childhood Arrivals program. See the online job descriptions here and here.